The Columbus Blue Jackets qualified for the playoffs for the first time in franchise history in the 2008-2009 season. They dropped four straight to the Detroit Red Wings, who eventually lost to the Pittsburgh Penguins in the Stanley Cup Finals. Columbus did not make it back to the playoffs until this year and dropped Game 1 to the Penguins. 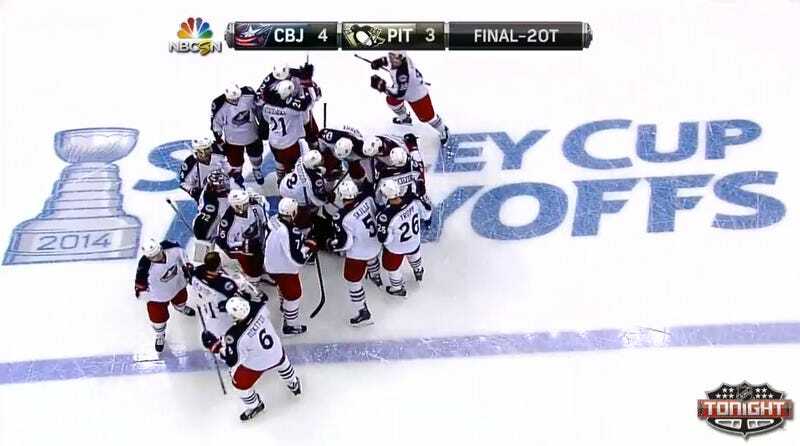 It took them six games (and an overtime-plus) over 14 years, but the Blue Jackets finally won a playoff game. Matt Calvert, a fifth round draft pick for the Blue Jackets in 2008, scored his first playoff goal earlier in the game. It was shorthanded and brought the Blue Jackets within one goal, 3-2. He scored his second, just over one minute into the second overtime to give Columbus the win. The series is now tied 1-1 and heads back to Ohio.